You have located a prospect. So now what. This is what I look for. I look for what I call the gold line, and that is the path that gold will most often travel. 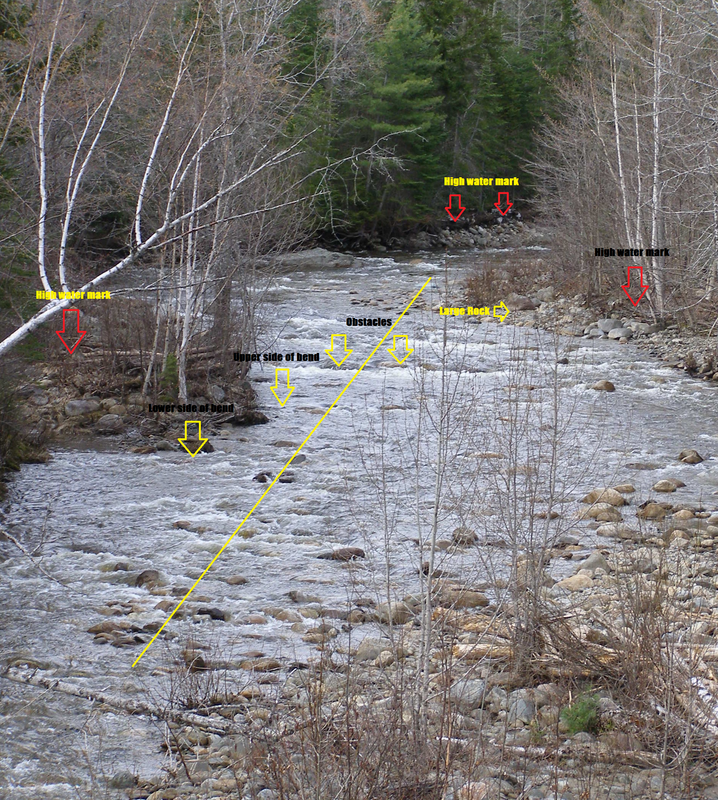 There are exceptions to this rule, but gold will more often than not follow a line from the inside bend in the river to the next inside bend in the river. I look at the inside bends and in my mind I draw an imaginary line. The gold may be found several feet to the right or to the left of this imaginary line. I also try to visualize the river at flood stage. I look for the high water mark. I then look for obstacles in the river such as boulders, tree stumps, the bend itself and try to imagine how the water was flowing over these or around these obstacles at flood stage. When the river is at flood stage the gold line may shift from side to side. The red arrows represent where the river can get at flood stage. Flood stage is when the gold will travel the most. Gold can and will deposit in the areas I marked with the gold arrows. 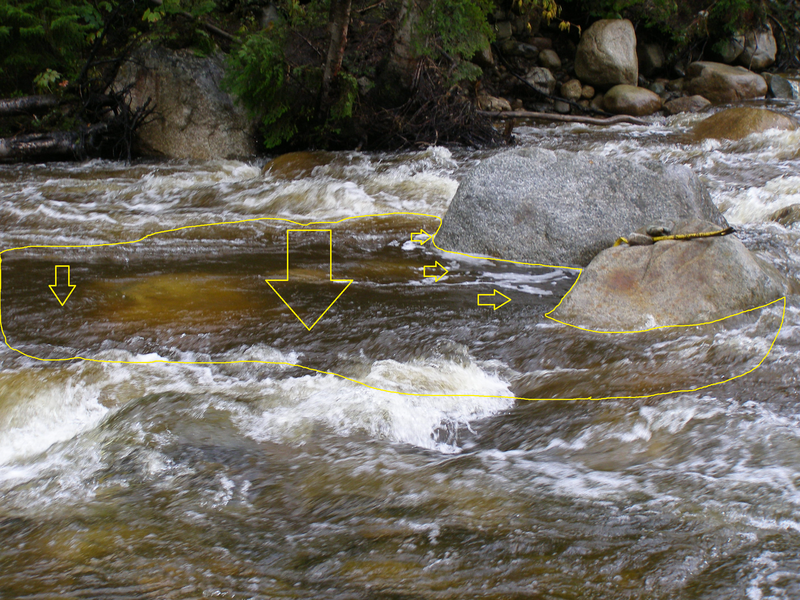 Notice the arrow pointing in front of the large rock, as the river flows over this gold will usually deposit on the down river side. This is a good spot to test. Next you will notice two arrows labeled obstacles, in this instance the obstacles are rocks with water currently flowing over them, you may find larger gold in areas such as this. The water is moving a bit faster causing the lighter gold to move farther down stream to a calmer location. The larger gold has enough weight to sit down in a white cap and stay there. The arrows on the bend show the upper and lower sides of the bend. 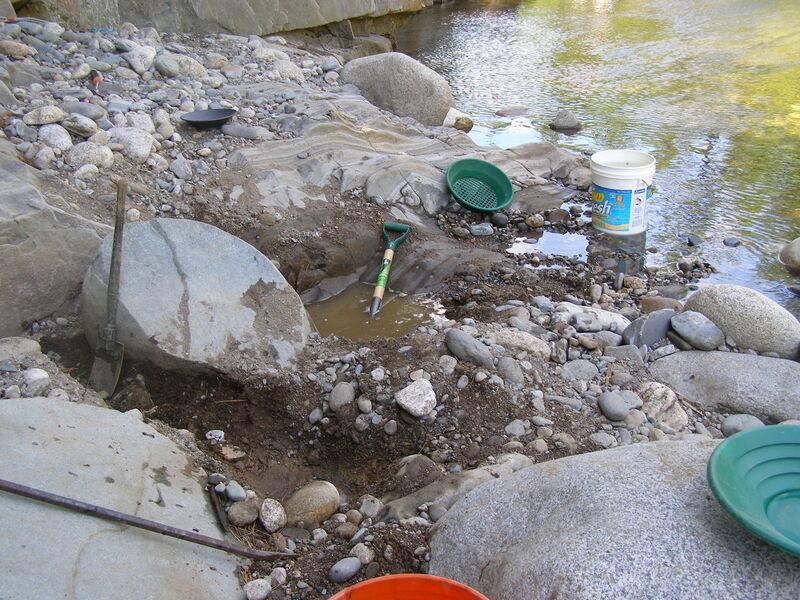 I will check both and every thing in between, gravel bars tend to build up here and these can yield some nice gold. 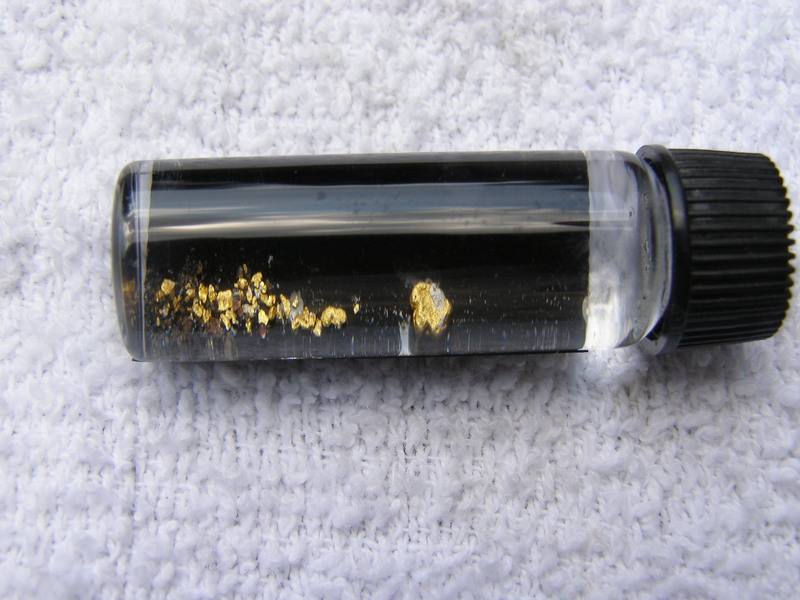 Gold will drop out any where the river slows or where it passes over an obstacle and a vortex (low pressure zone) is created. Once you find a location that has given you positive test results then that is the spot to work. The goal will be to get down to bedrock or the clay layer which will act as a false bedrock. You may find gold all the way down to the bedrock and as you get deeper you will find other heavies such as lead sinkers and so forth. This is a good sign, if lead is in your hole then it is a good chance that there will be gold to. The deeper you get the gold can be bigger. 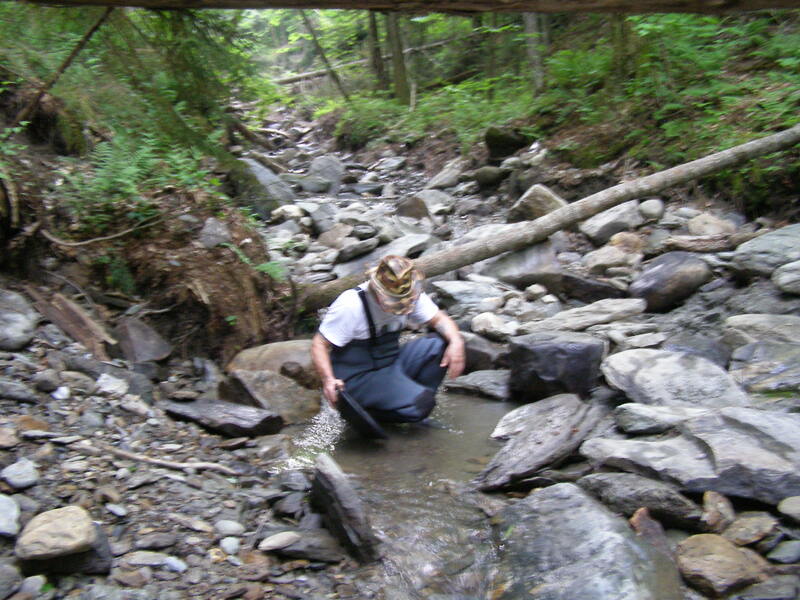 This is not an exhaustive study on how to read a river, but it is enough to get you out there and get you started on your own gold prospecting adventure. 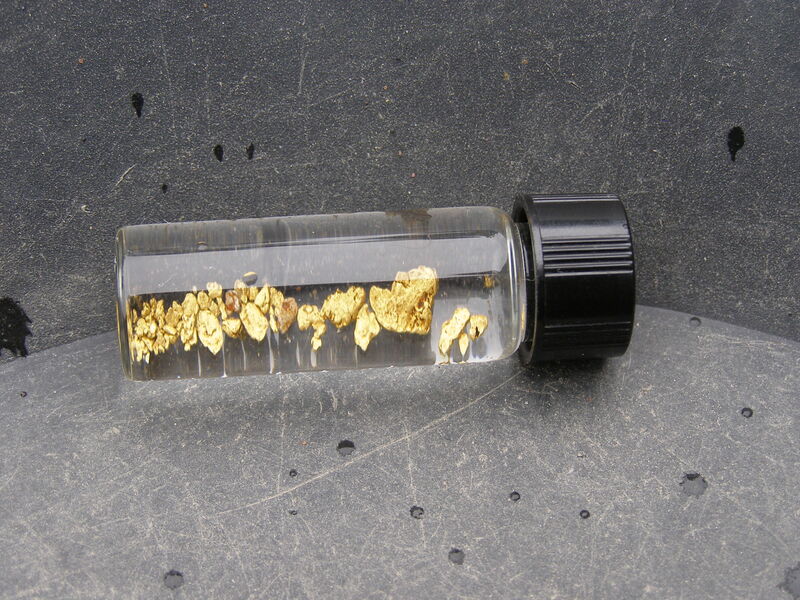 Now get out there and find some gold!!! !